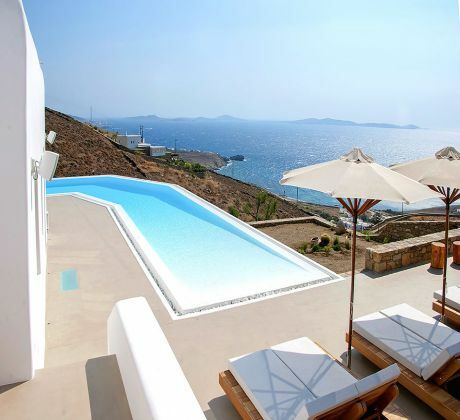 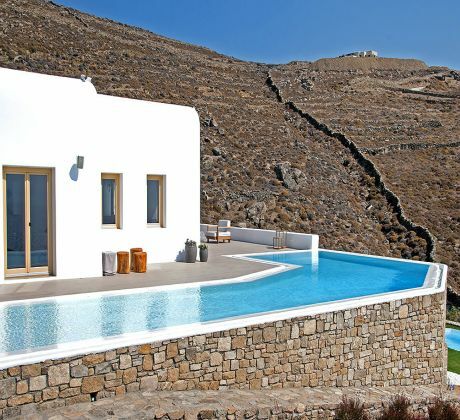 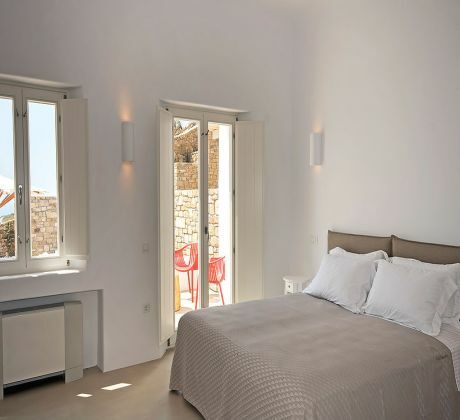 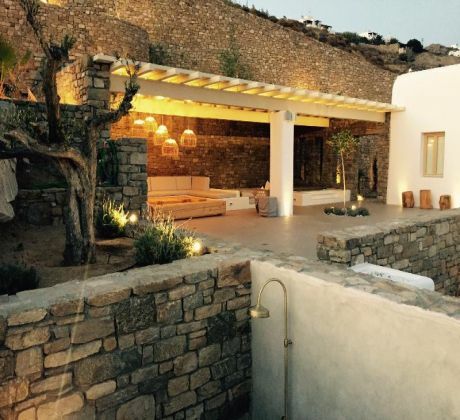 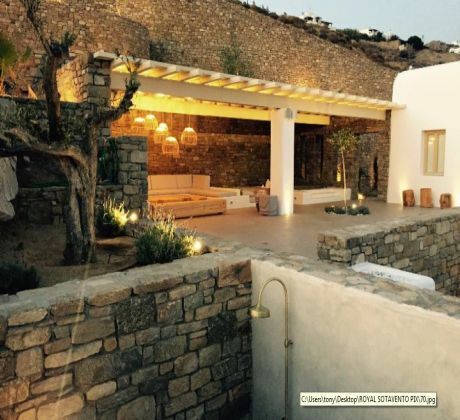 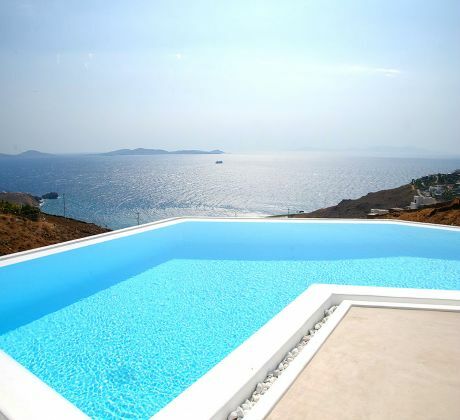 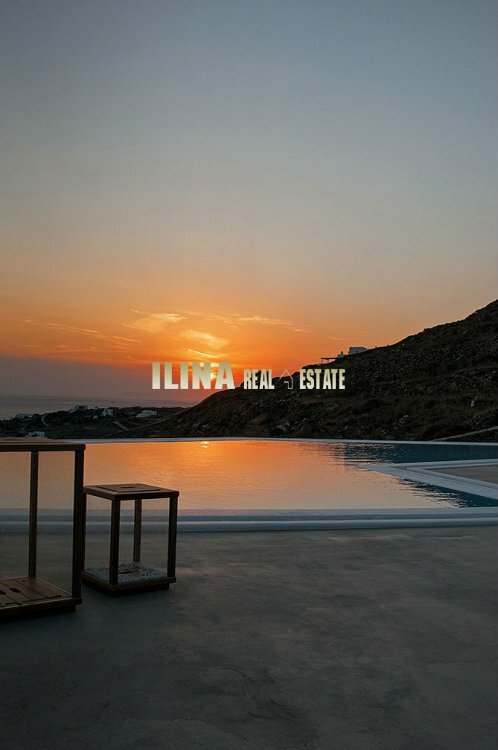 Overlooking the unique pebbly beach of Houlakia, which is a protected area, the islands of Delos and Syros, this superb villa is located at 7 minutes from Mykonos town, and 5 minutes from Ag. 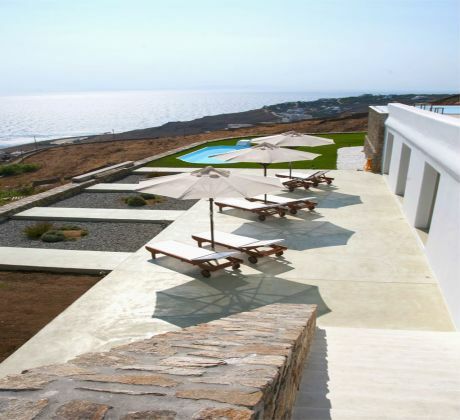 Stefanos beach. 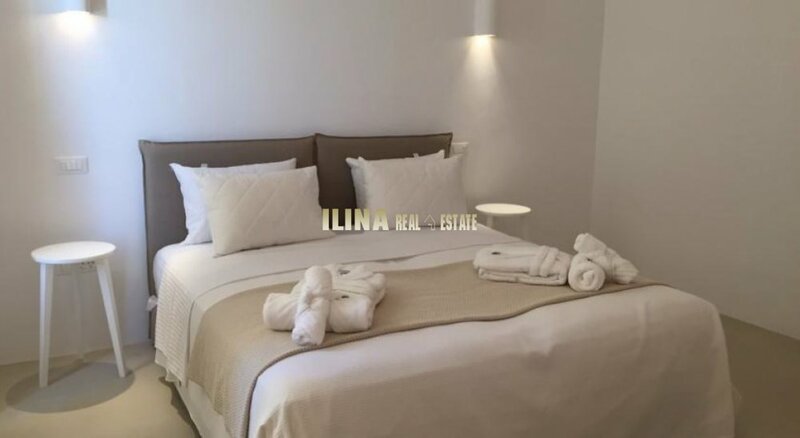 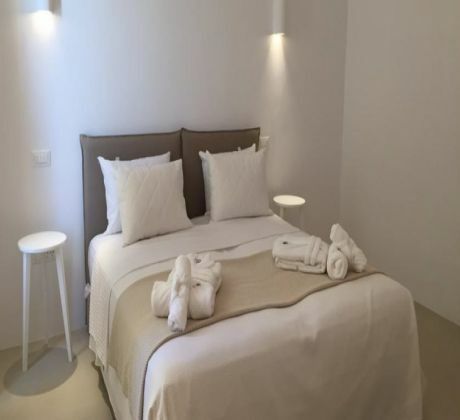 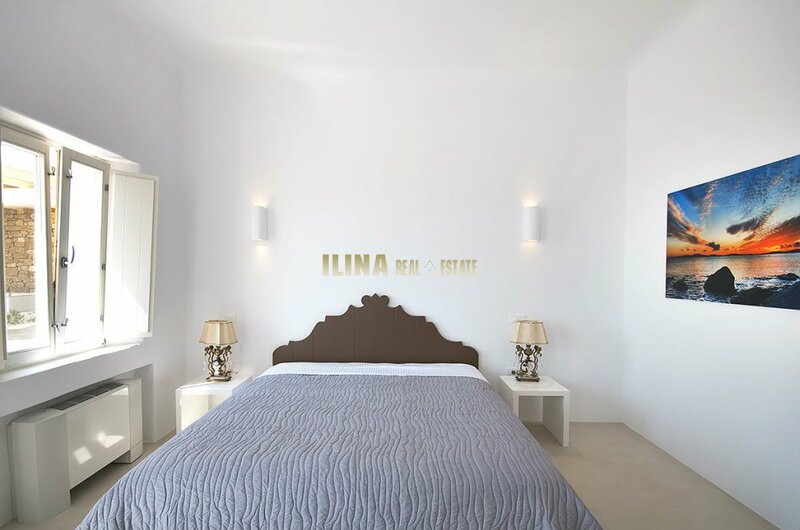 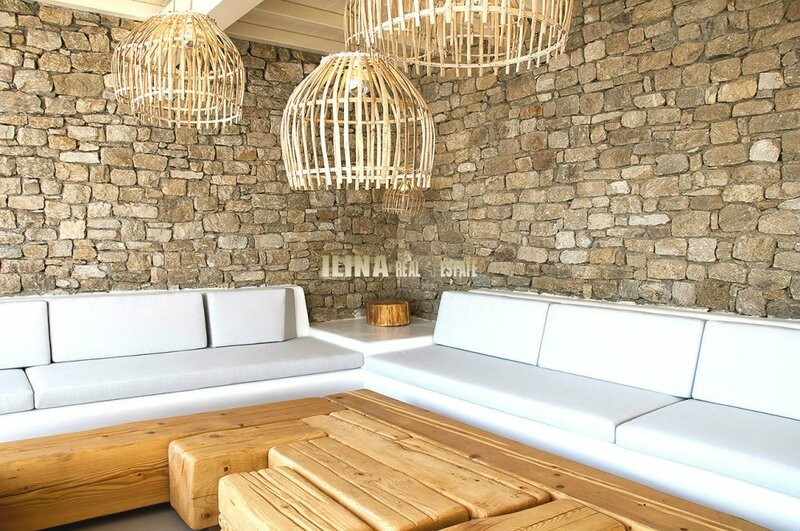 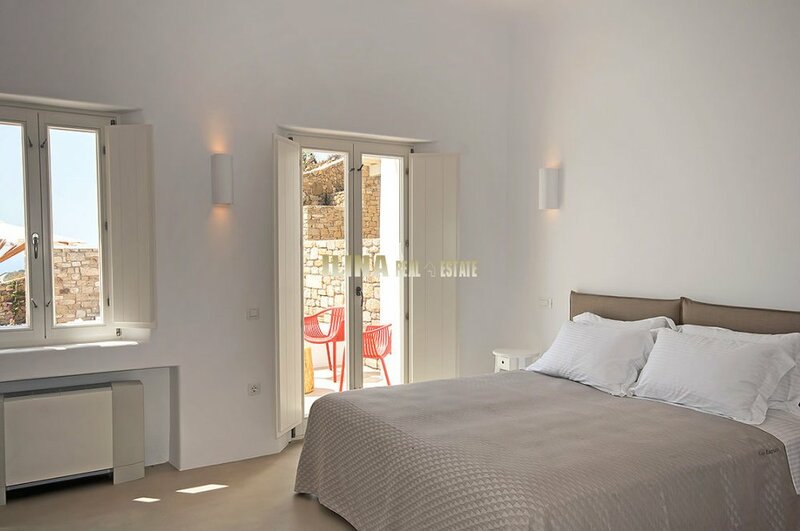 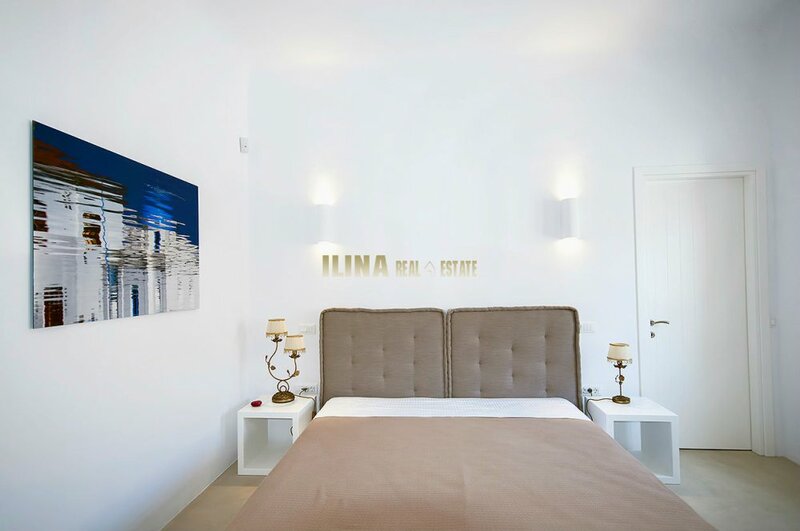 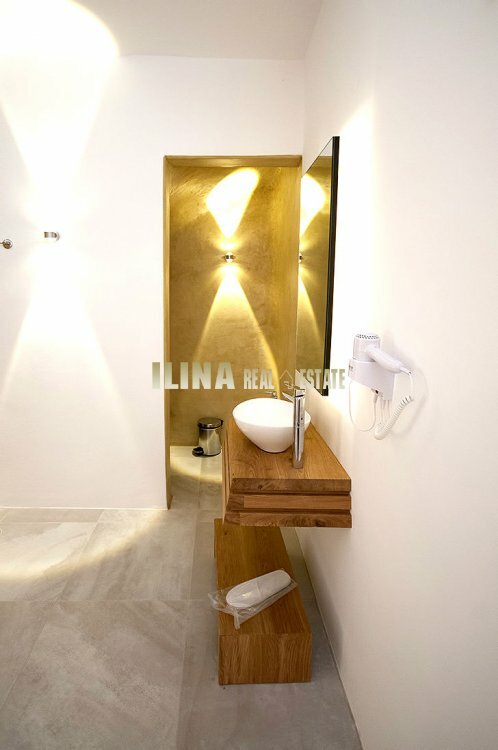 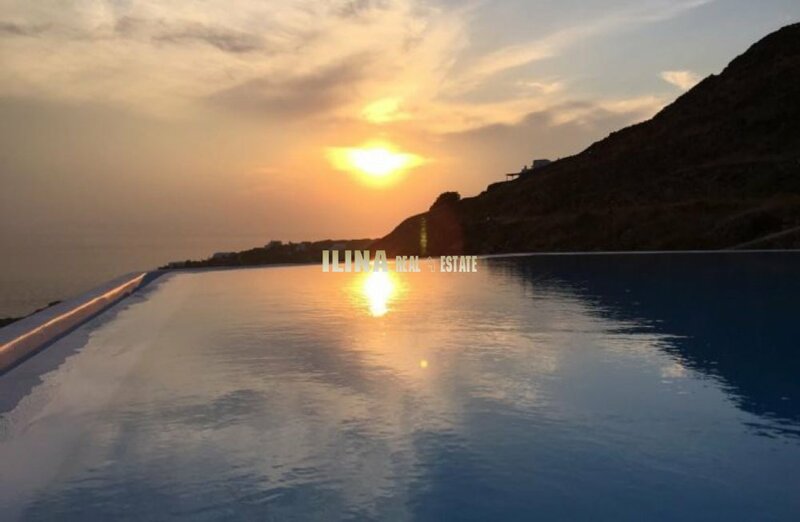 This secluded villa offers to the guests the sense of privacy and relaxation well protected from the north Mykonian winds, while a small car ride to the notorious night life of the island. 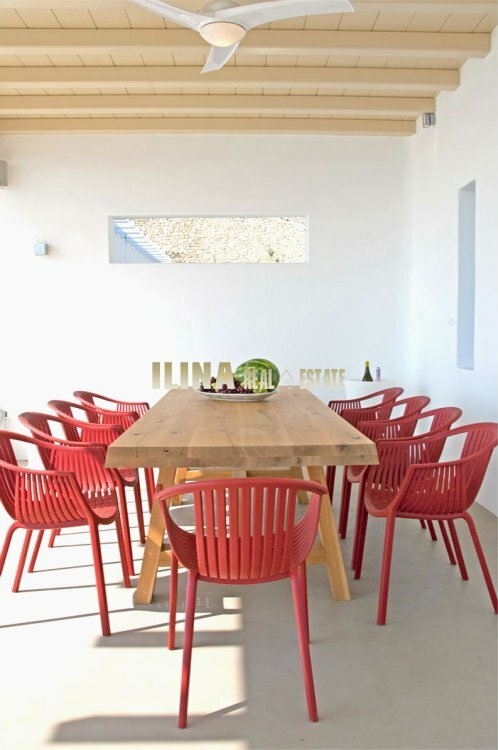 The villa’s design ensures a spectacular view to the sea from all the outdoors sitting and dining areas, and it is ideal for jogging or hiking. 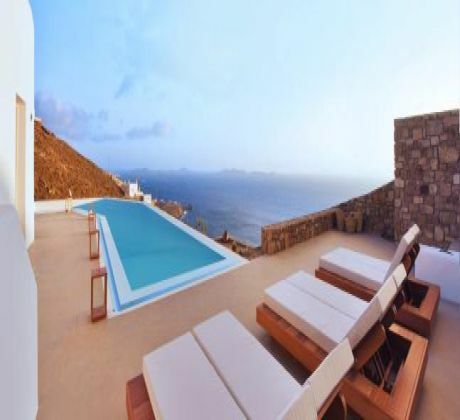 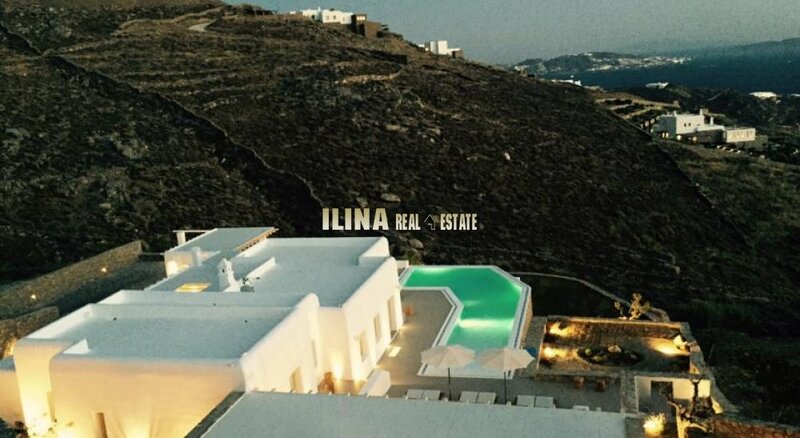 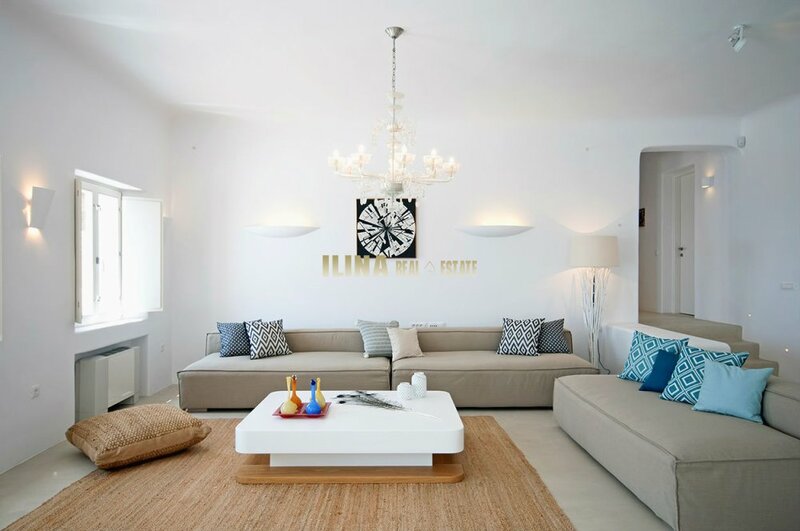 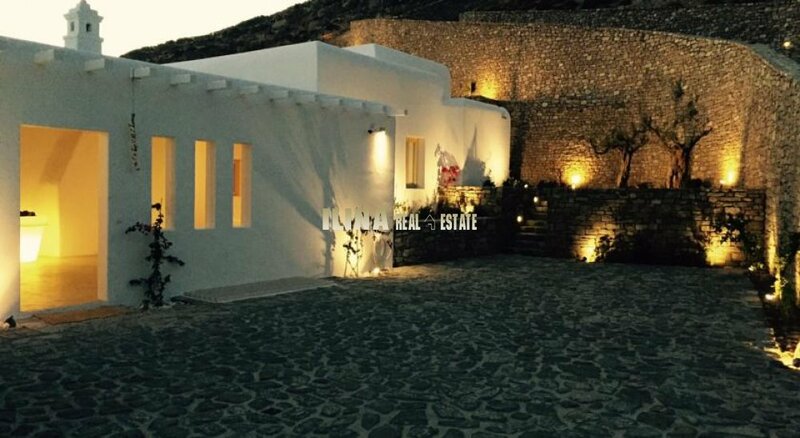 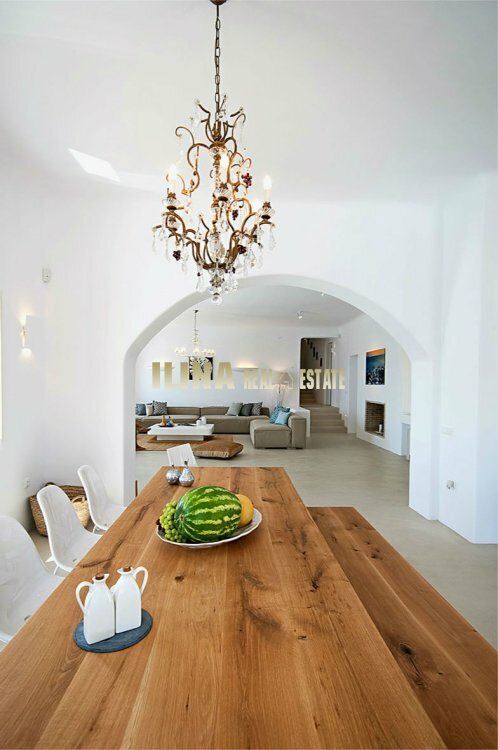 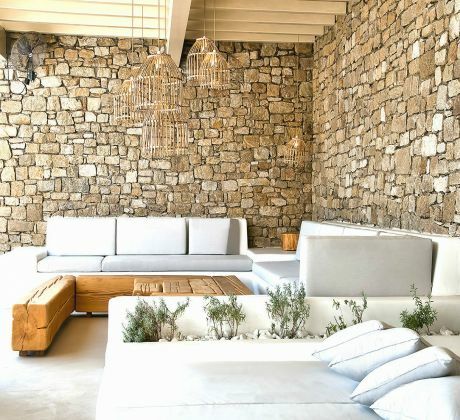 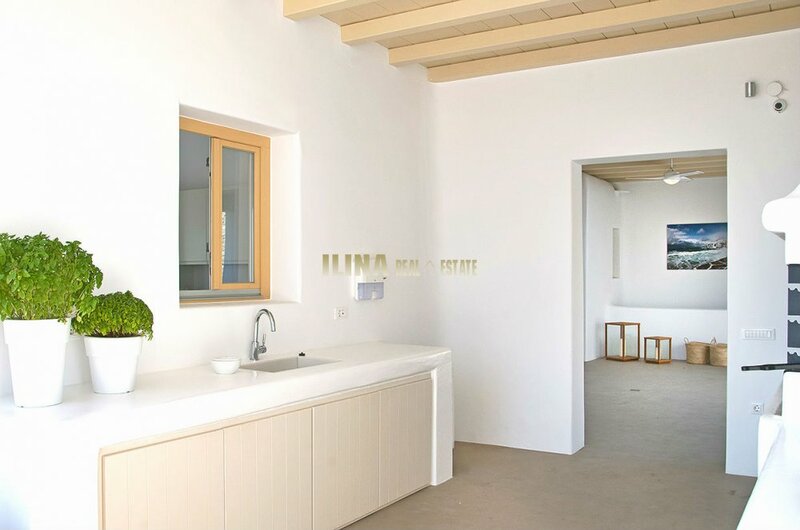 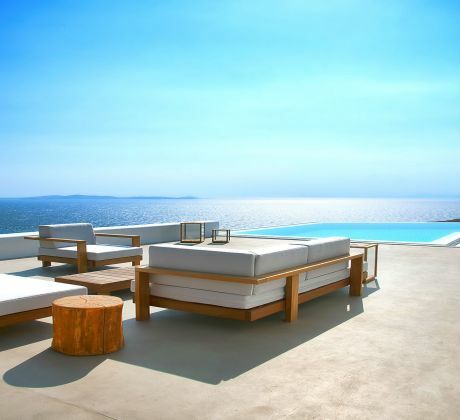 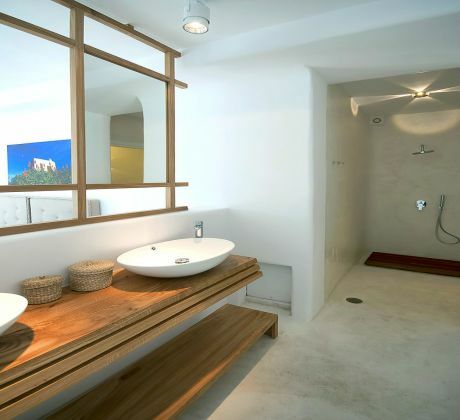 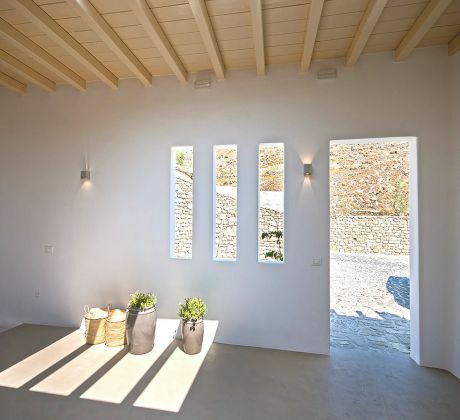 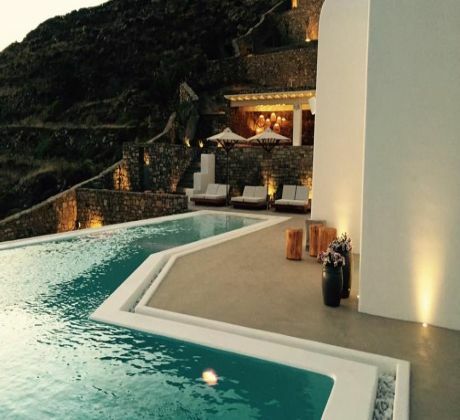 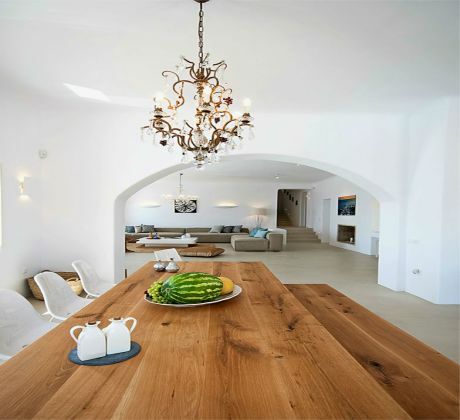 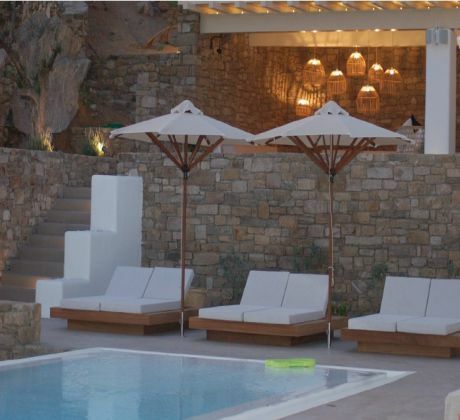 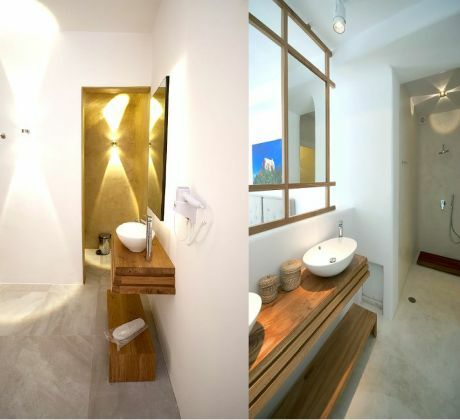 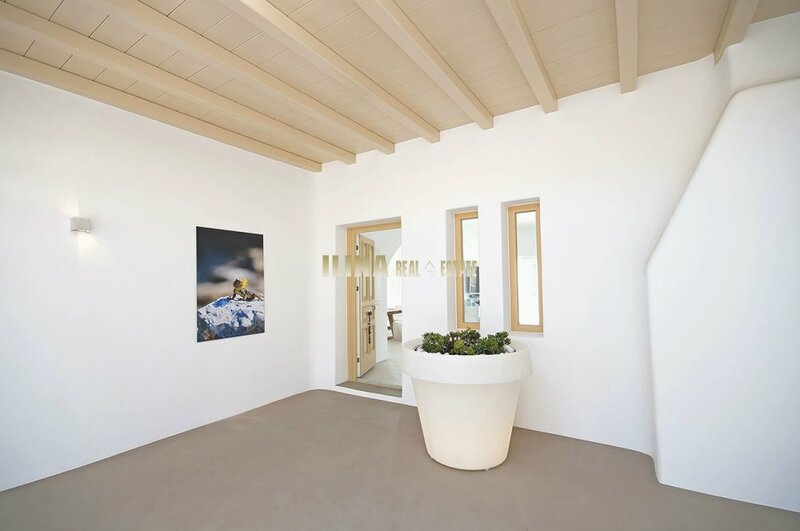 A 510 m2 villa is built in a 4900 m2 plot, in a serene environment, surrounded by the fabulous typically Cycladic stonework. 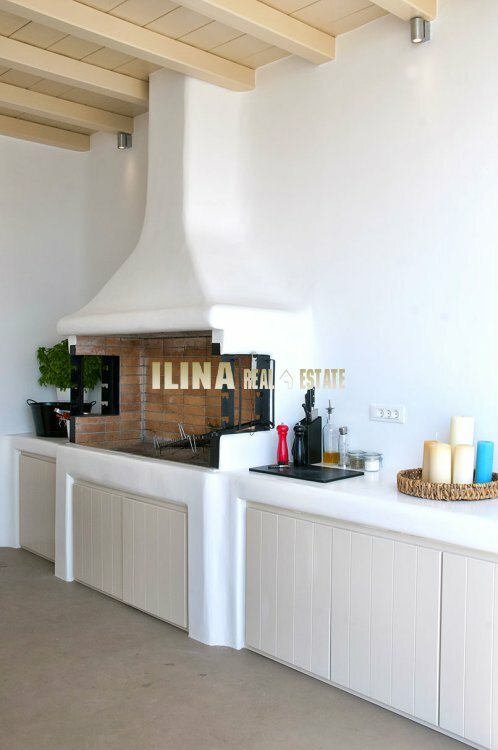 The guests of the villa can enjoy both swimming pools while gazing at the stunning view of the sunset. 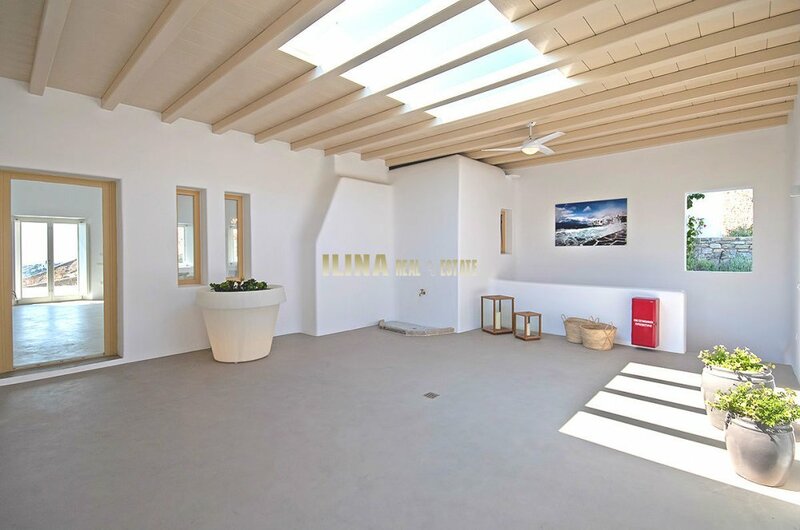 The large outdoor spaces are equipped with sun beds, Jacuzzi, barbecue, & dining area. 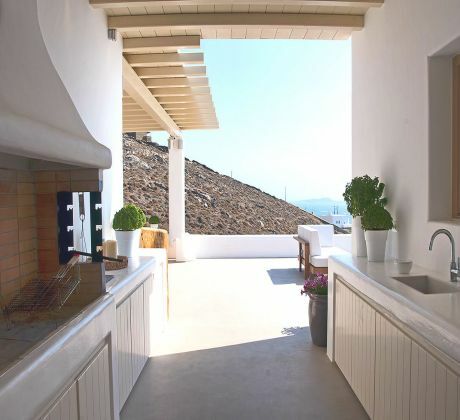 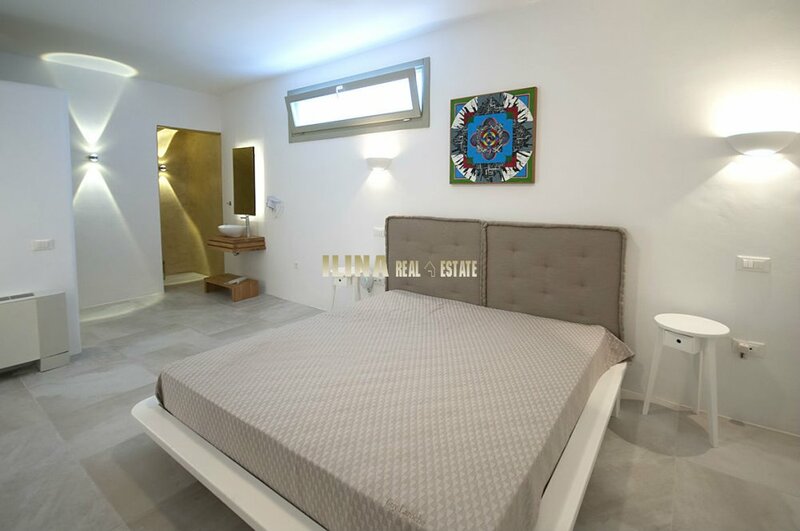 Divided in two levels, the villa’s upper ground level has three bedrooms and three bathrooms, two of them en suite, spacious living room, open plan kitchen and dining area. 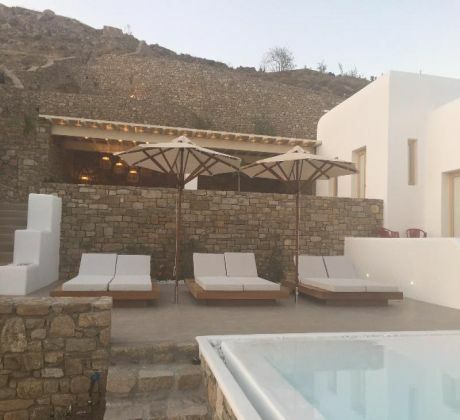 The lower level has 4 bedrooms and 1 guest house all with en suite bathrooms. 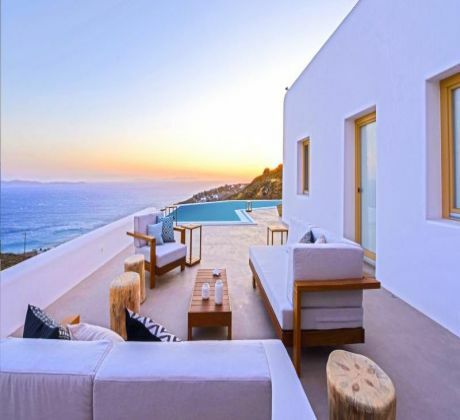 Three of them have amazing sea view. 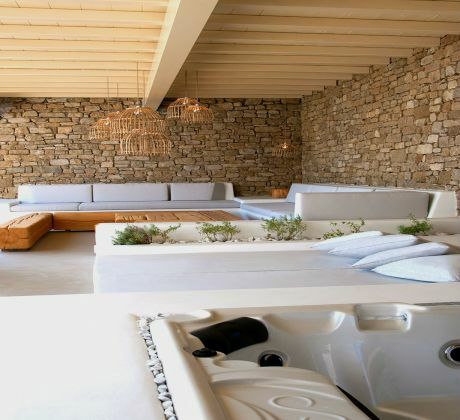 There is a sizeable gym, a massage/hammam area, along with an extra bathroom. 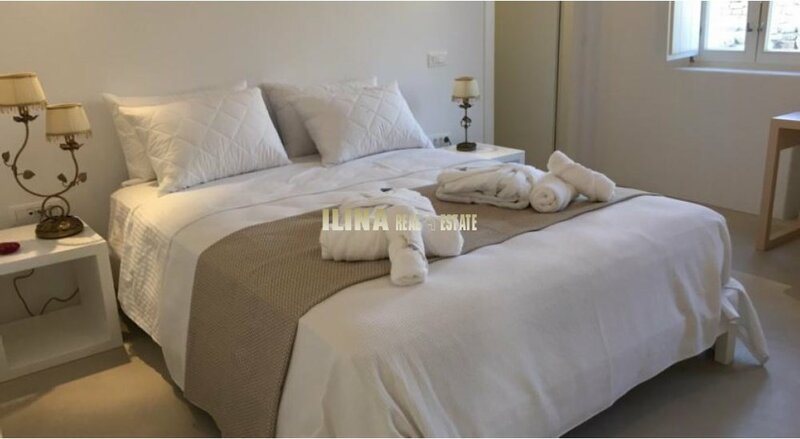 Moreover there is a fully equipped kitchen and an office space that serves the lower ground level. 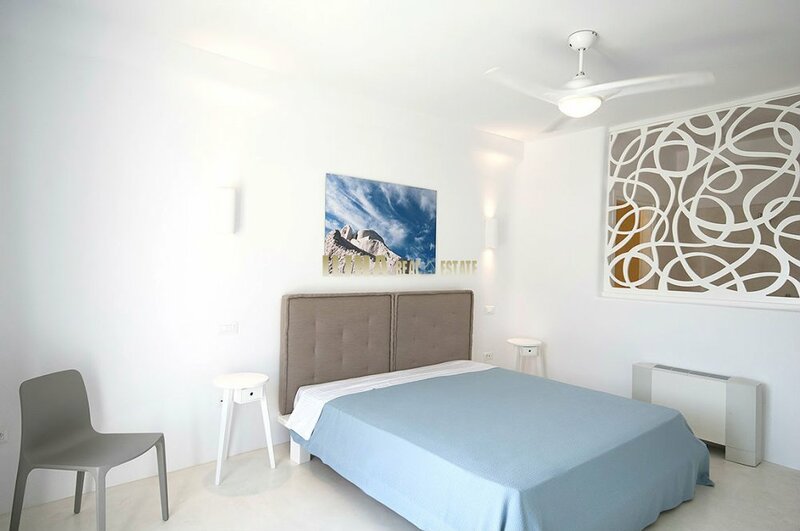 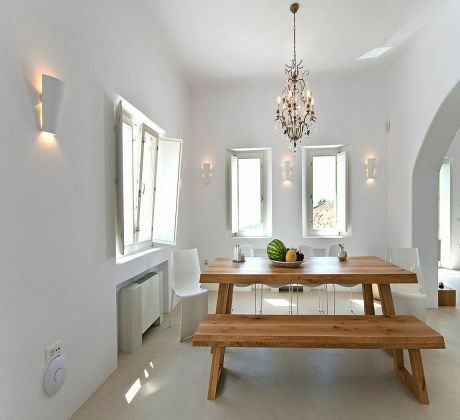 The villa accommodates up to 16 guests in 8 bedrooms with air condition units and ceiling fans as well as TV and Wi-Fi.